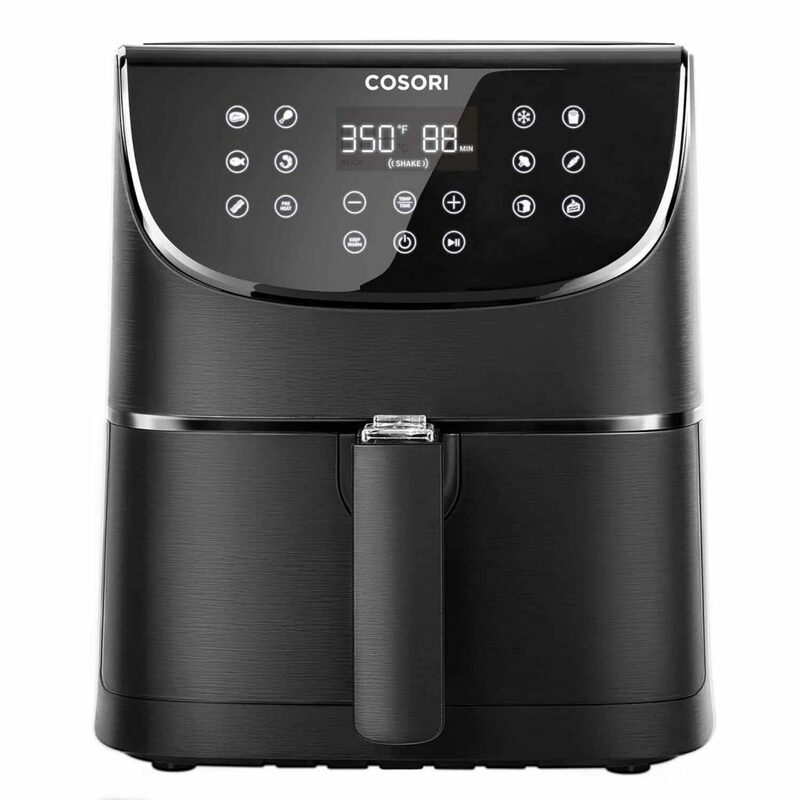 We Reveal the Top 5 Air Fryers of April, 2019. 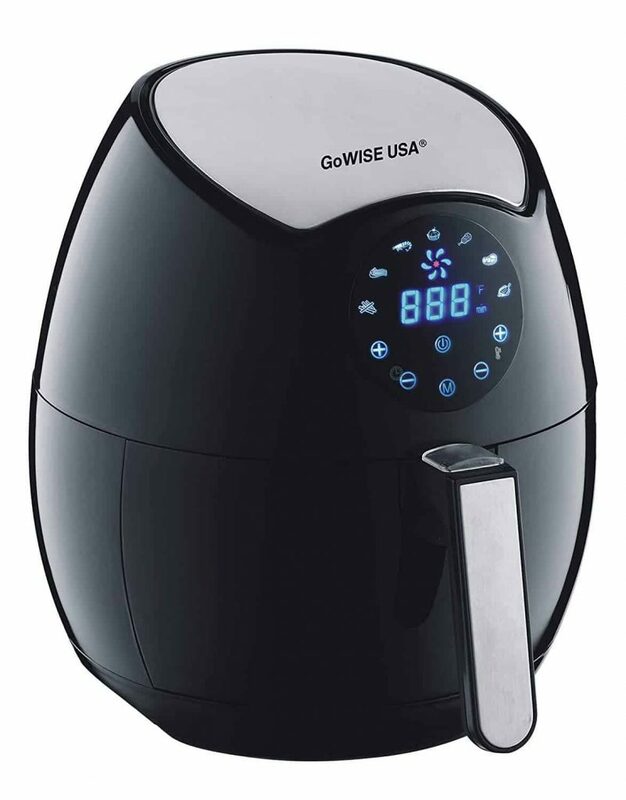 Discover The Best Air Fryer now! Finally, healthy fried food that tastes amazing! For years the only way to get deliciously moreish fries at home was to have a greasy deep fryer lurking in the corner of your kitchen. But no more! 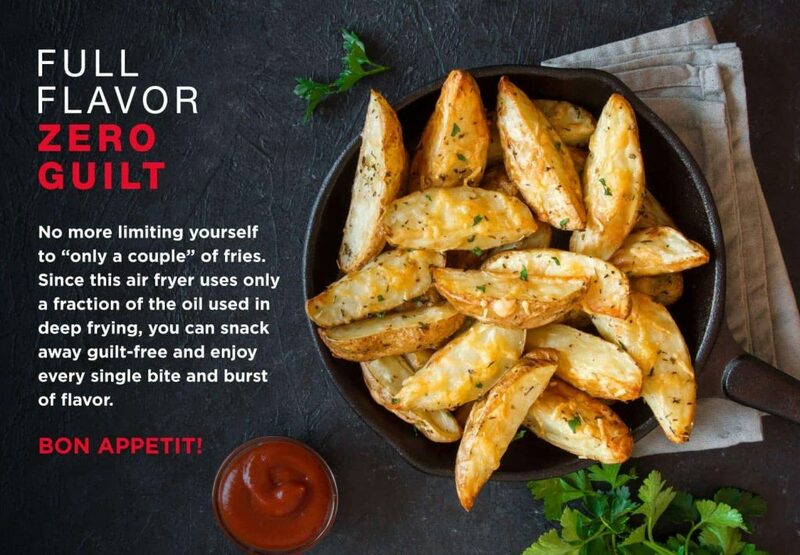 Now guilt-free and delicious fried foods can be yours whenever you desire. Capacity – The average fryer can cope with approximately 2lbs of food in one go; however some models have a larger capacity, suited to a large family. 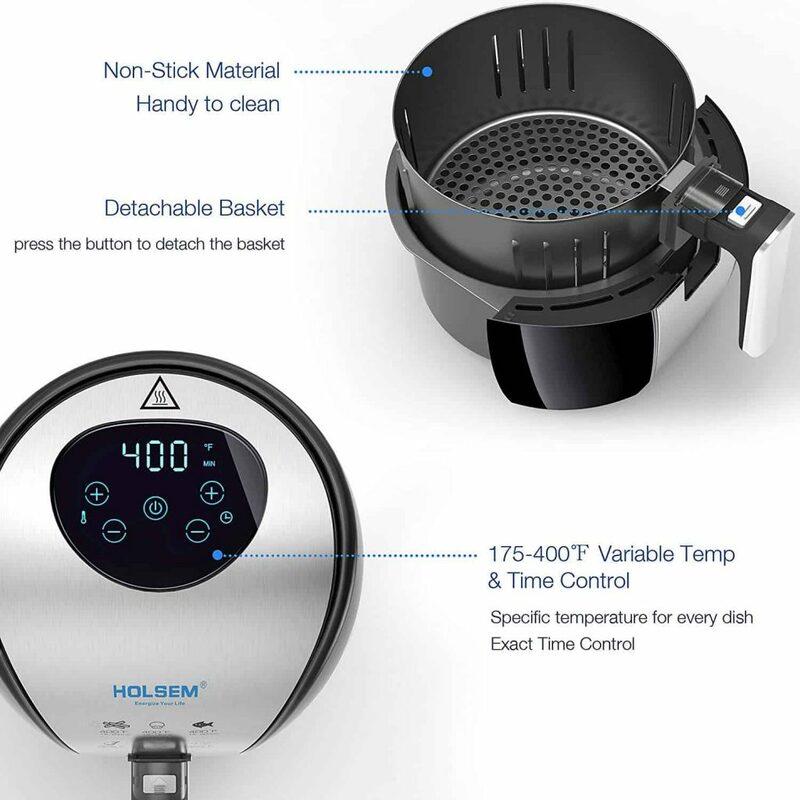 Controls and Features – Does it have a timer, or temperature control? Can you switch between different cooking modes? Will it fit in the space available? It’s been a real hardship to review these fryers – how many healthy fries can we eat? Actually, more than we ever thought possible. 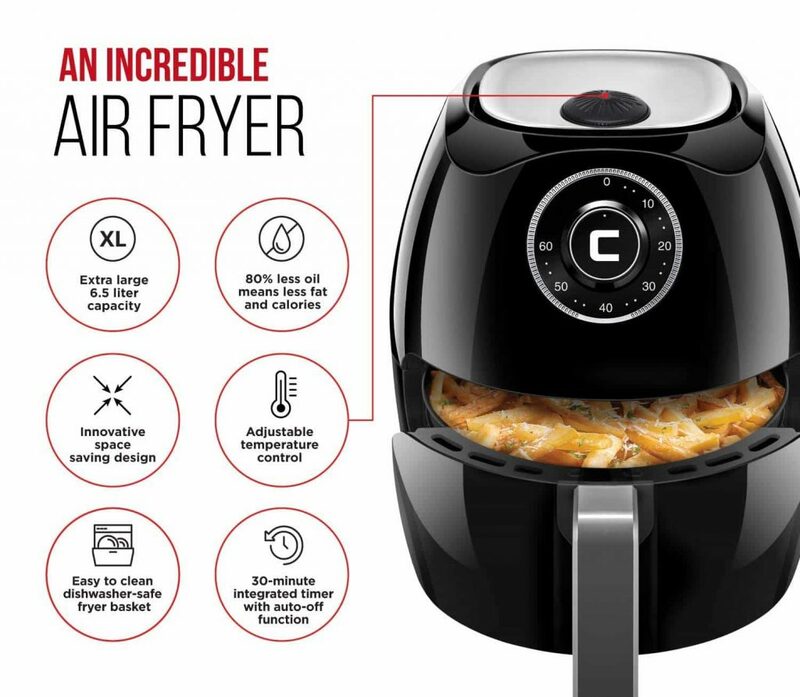 We’re wowed; there’s not much this popular airfryer can’t do. It does roasting, frying, re heating, and baking, all viewed through a handy window to wake up the taste buds. 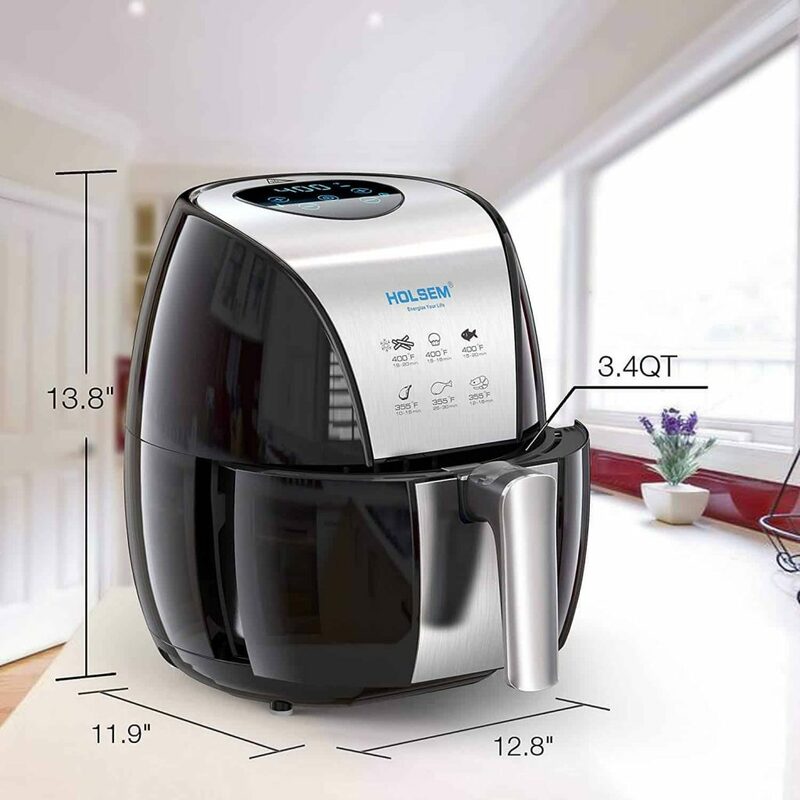 It’s sleek, and although it bears more than a slight resemblance to something worn by a Storm Trooper, it is well worth giving this more-than-just-an-air-fryer space in your kitchen. Sometimes when a gadget attempts to multi task, it’s merely a jack of all trades; however, the Chefman masters everything thrown at it. Our roast chicken was moistly delectable, with an evenly browned crispy skin. Everything seemed to have a lot of more flavor than the other fryers (we used the same oil throughout). Even the chocolate cake that we whizzed up out of sheer desperation for a chocolate fix cooked quickly. The Chefman itself exceeded our expectations; however, after 20 or so uses, the coating started to come off the basket. This isn’t a deal breaker for us, at all. The food was still delicious, and the fryer still performed perfectly. This is an excellent product, with abilities beyond just deep frying. 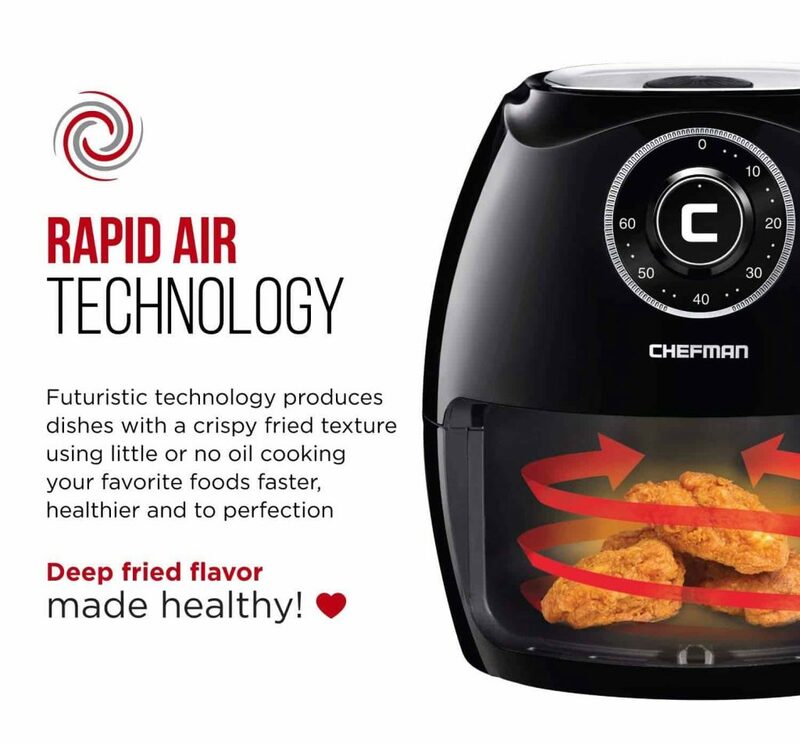 No wonder so many air fryer reviews are crazy about it. Unpacking this fryer, we were positively surprised by how much was included. Holsem have thought of everything. 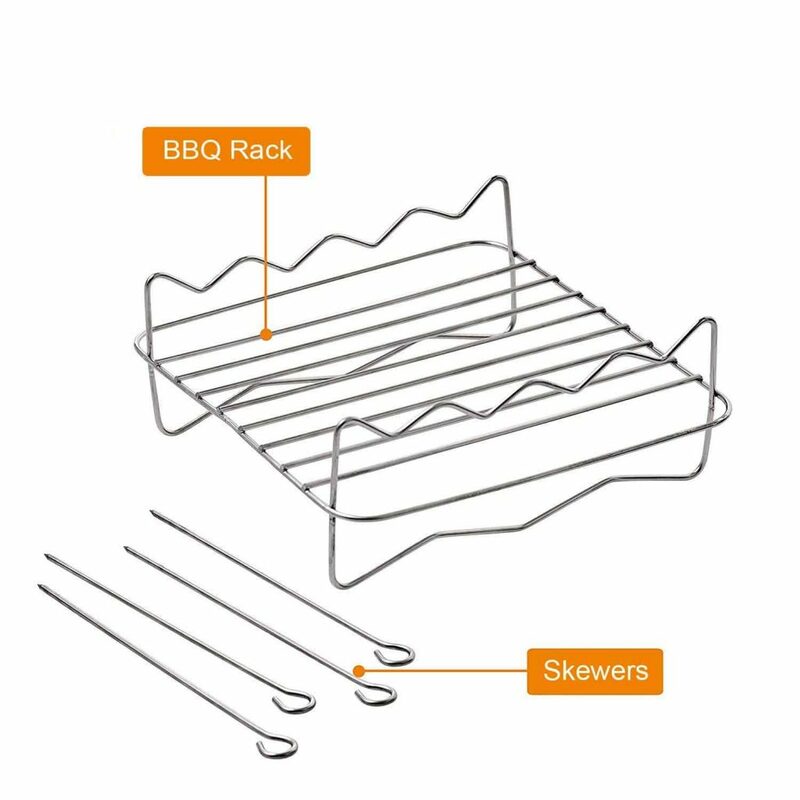 There are baskets, an extra grill, tongs, cake moulds, and even replacement little rubber feet so that it never marks your surfaces. The recipe booklet is glossy and full of yummy looking ideas. First appearances count and in this case, they were impressive. We remained impressed as we put it through its paces. 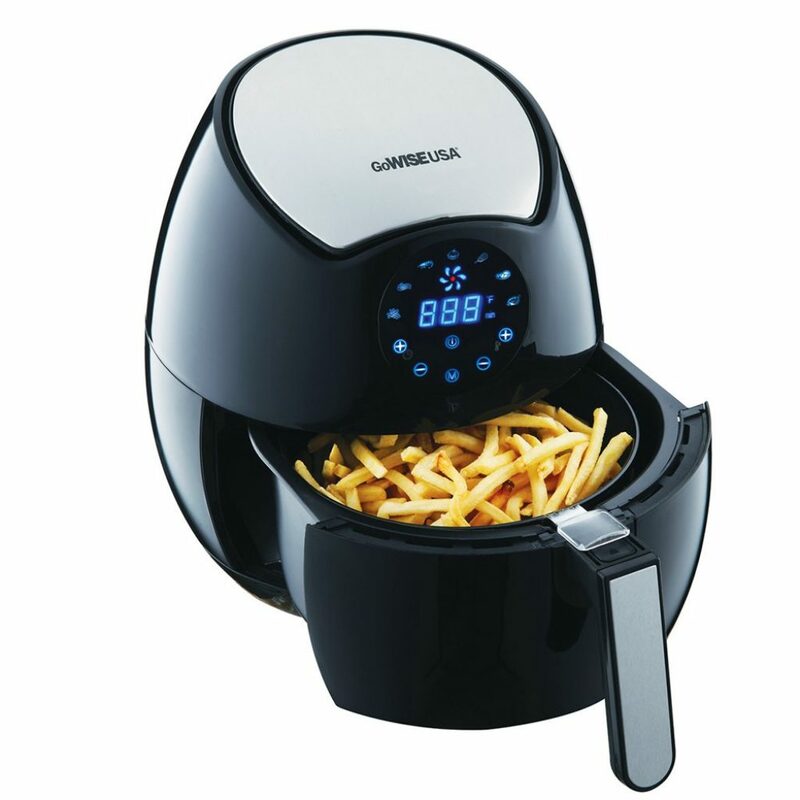 First, the fries – crispy outside, fluffy in, and cooked to perfection using the timer. Next, chicken. The large basket can hold enough for several hungry people, and again, delicious. We tried several recipes, giving it a full workout, and this fryer performed well every time, and was easy to clean afterwards. That this fryer is sleek and stylish is obvious, but it works well too, with the ability to create a lavish feast for guests, or a quick guilt free supper for one. The timer is really useful and easy to set. 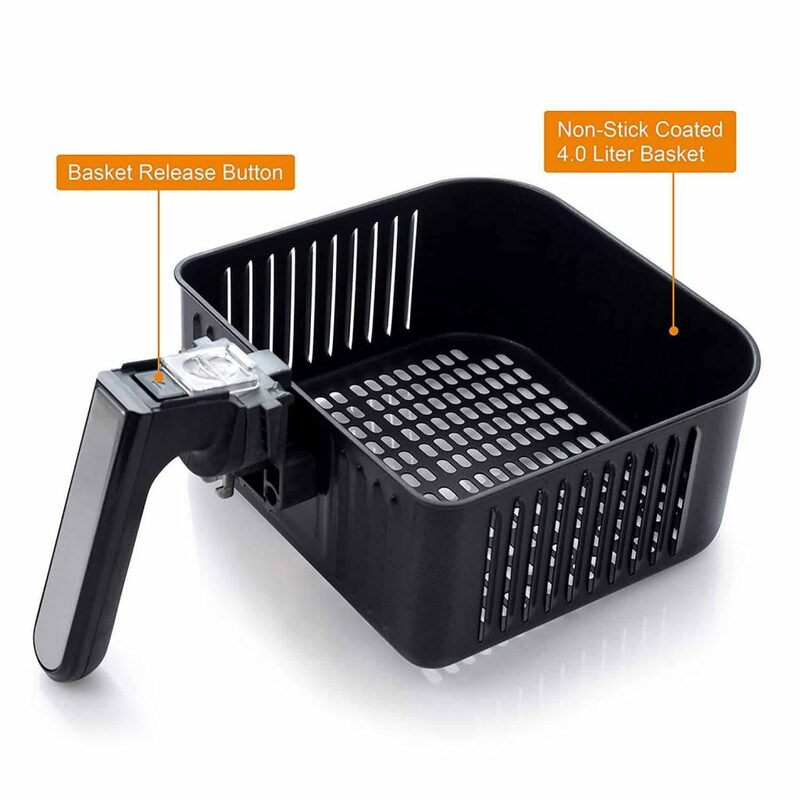 If you want to check how your food is doing, just pull out the basket, there’s no need to alter the timer as it automatically adjusts once the basket is slotted back. The instructions could be a little clearer – sometimes we had to guess what to do. Luckily, it’s simple to use, so we got along just fine, but maybe, Holsem, they could be a little better. Also the cable could do with being longer, making positioning easier. We really like this product, and after trying it out, several friends have now ordered their own. 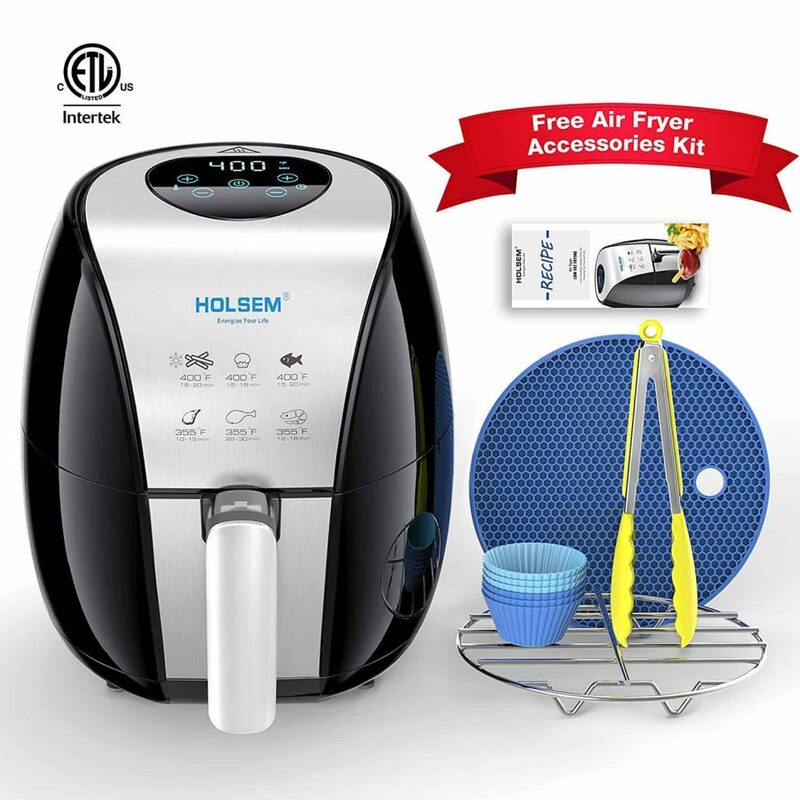 The extras that come with it are well thought out and useful, and we really felt that we were getting a great fryer for a good price. ETL Listed & 6 in 1 Multiple Functions：Fry, bake, steam, grill, roast and unfreeze - all in one, see detailed description in the cook book. 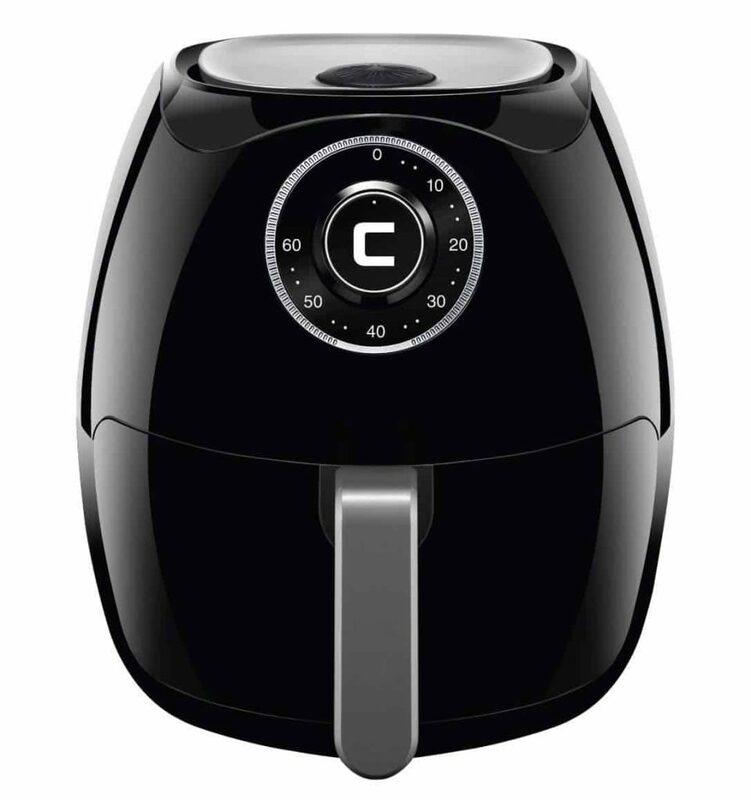 This ETL-certified air fryer is a great all-rounder. 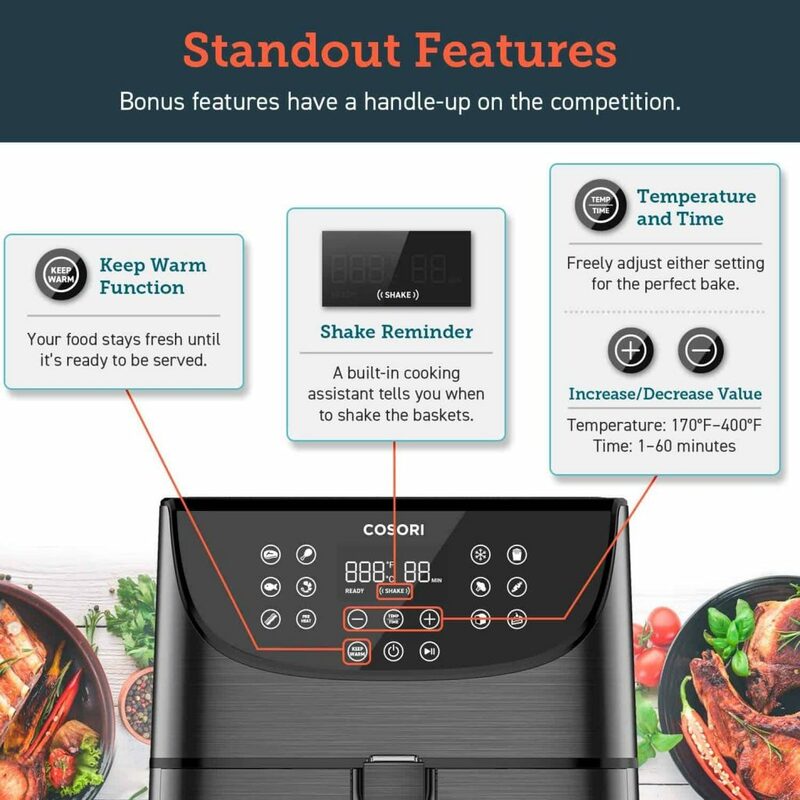 It cooks in 360 degrees and the perfect crisp system ensures that everything comes out crispy on the outside and moist on the inside. 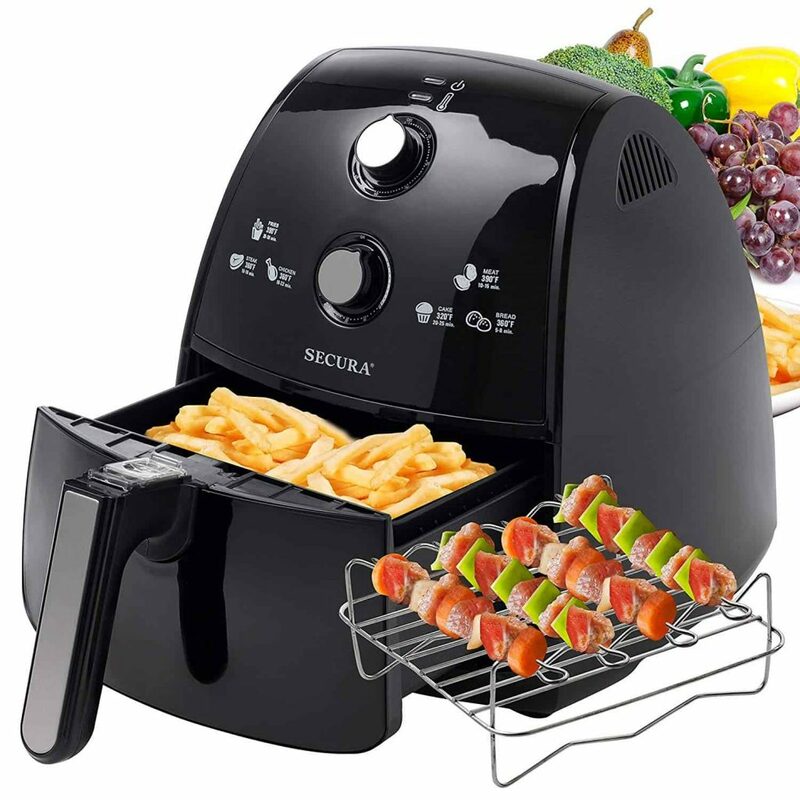 The majority of functions possessed by this Fryer perform up to expectations. 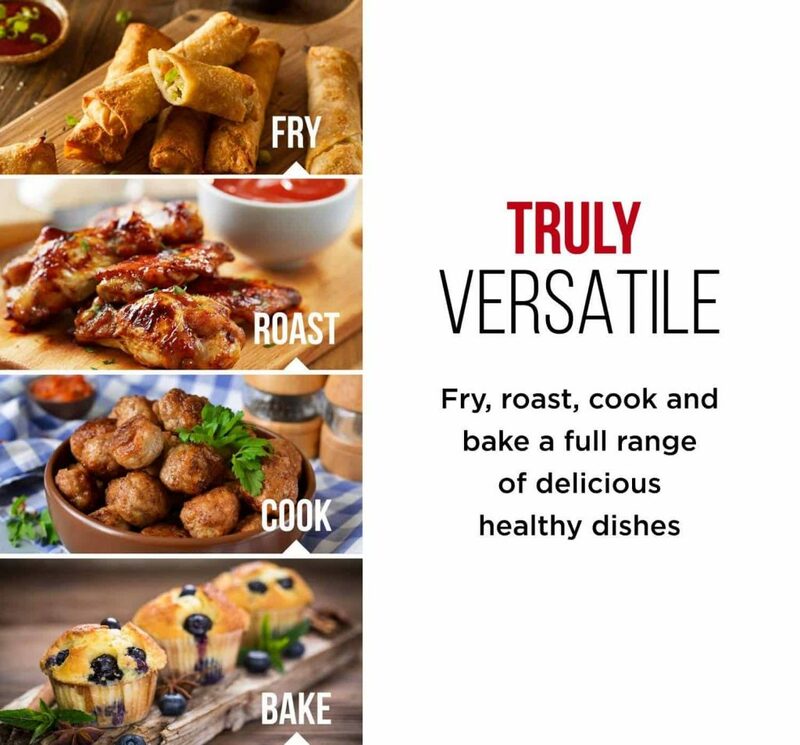 It produced the perfect roast chicken, we have fried eggs, made kebabs, chips and muffins – every single item has come out just as we desired, and in half the time of a conventional oven. The basket is a little smaller than anticipated. It may not be able to cater for a huge family but if that’s not an issue, you’ll love it. 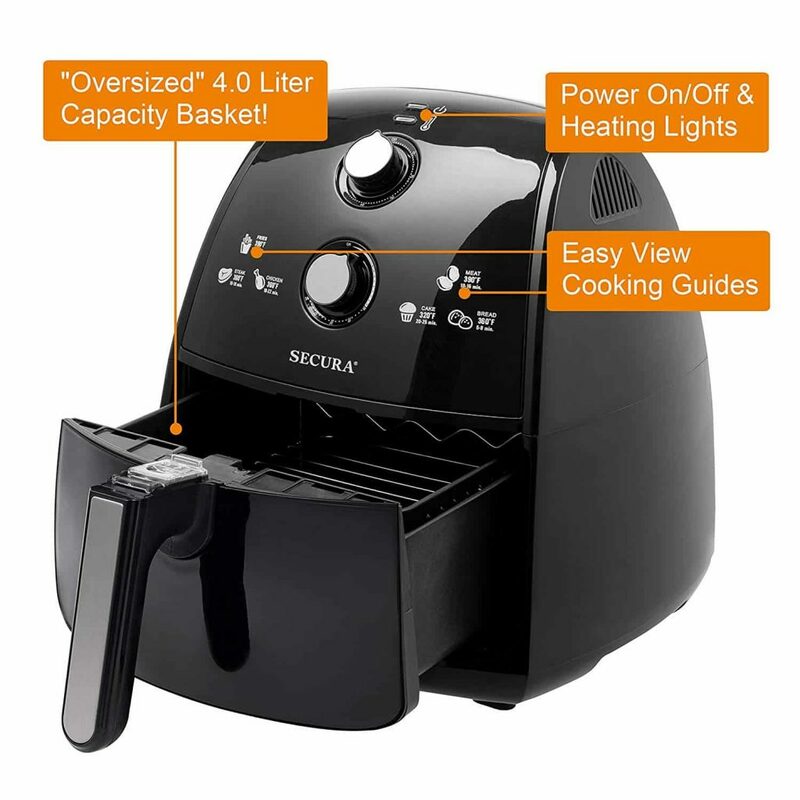 This is a smart air fryer that delivers everything you need it to. A little on the smaller side for families, but all in all, we loved it. This is one of the cheaper models we tried, but don’t let that put you off. 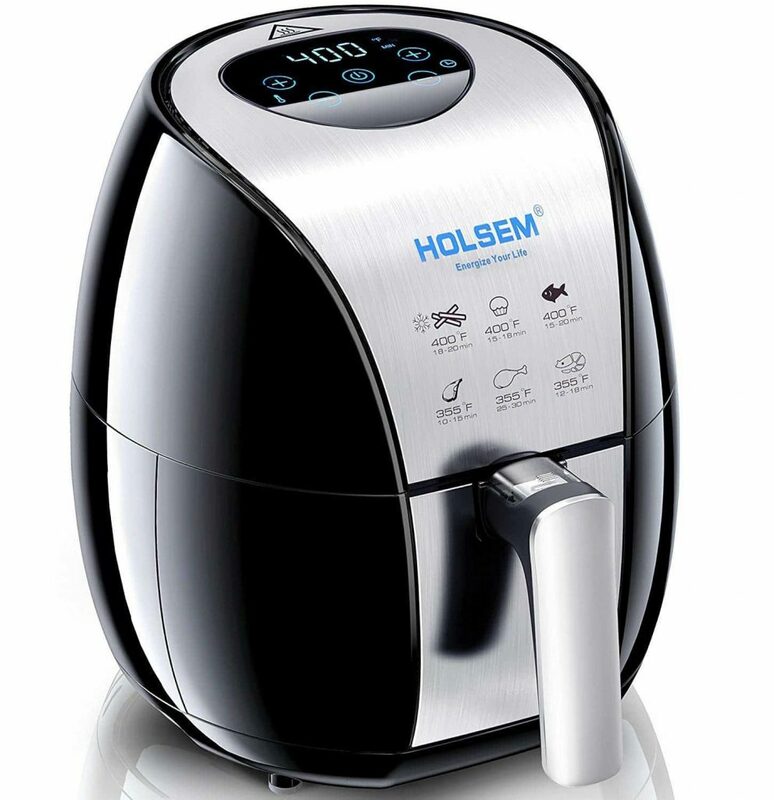 It doesn’t come with the impressive extras of the Holsem, or the disco lights of the Power Air Fryer, but this is a user friendly, no frills fryer. It does what it says on the box, and it does it well. 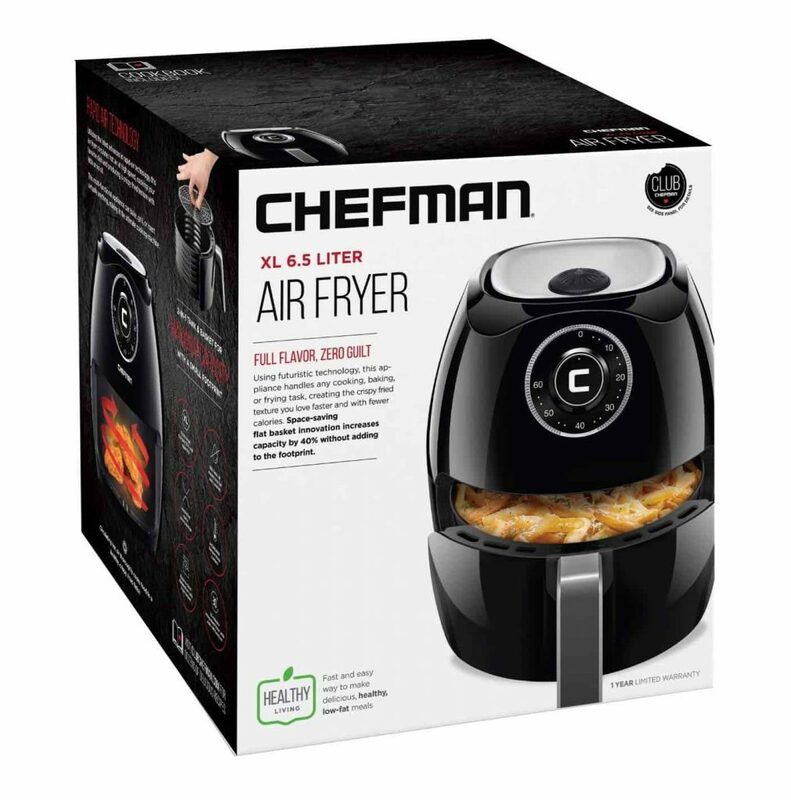 We like this air fryer – it’s honest, very simple to use, and doesn’t take up much room (yet still has a decent family-size capacity). It’s also quiet to use, and easy to clean. 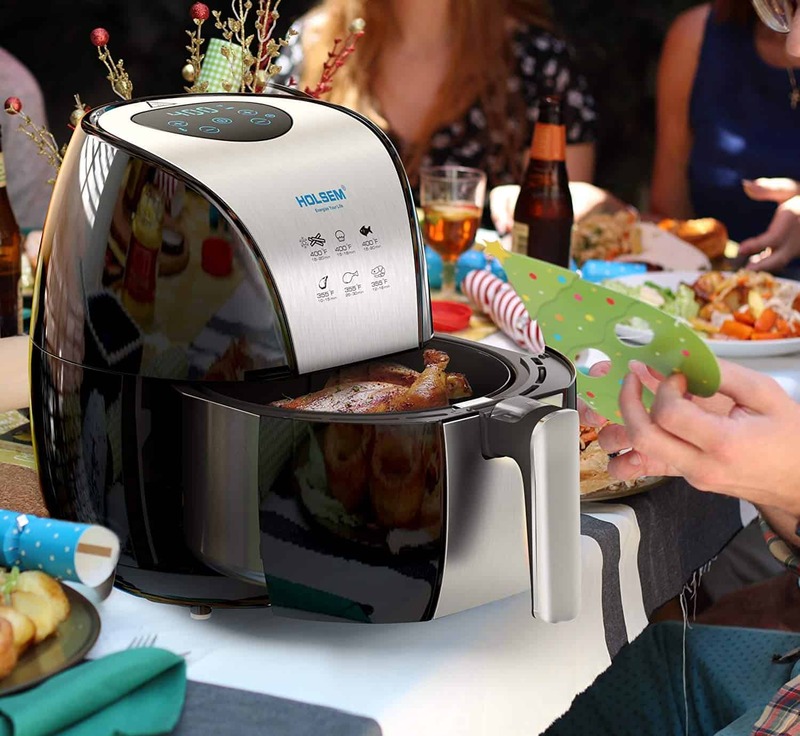 It’s the fryer we would happily gift to someone special. The longer length cable makes for easy positioning, and it never gets even the tiniest bit warm on the outside. Okay, there are a couple of things that could do with re thinking, but for us they aren’t a problem. The knobs should ideally be ridged or ribbed, for easy turning and positioning. Also the only power knob is the timer. This means that every time you peek at your food, you have to set it back to zero. While this is unconventional, it hasn’t hindered any cooking. As you may have guessed, bar a little room for improvement, we're big fans. It’s unobtrusive, makes great food, isn’t full of self importance and sticks to its promises. This happy little fryer is one of Amazon’s Best Sellers year after year. We tested this model in a shiny, slick black with brushed steel fittings. It’s stylishly good looking, and satisfyingly rotund. 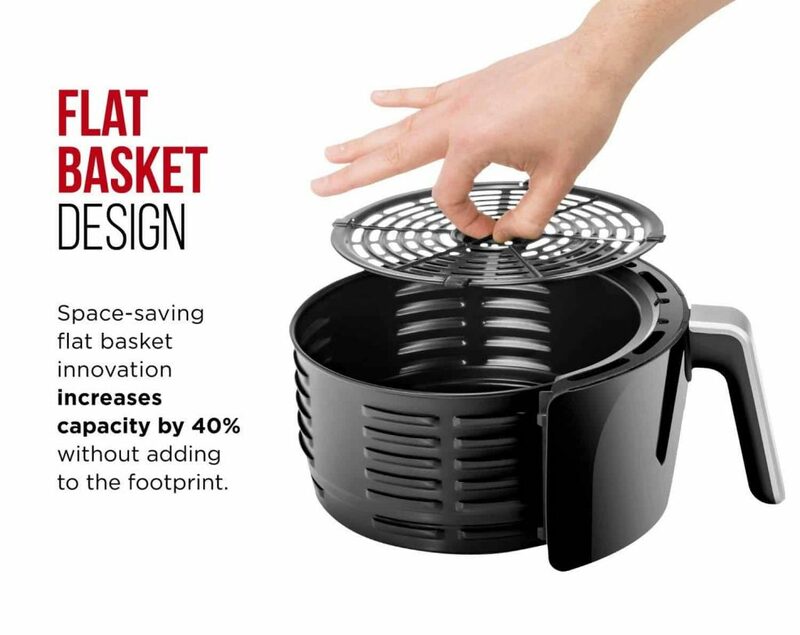 It comes with a non-stick FDA-certified and PFOA free pan and detachable basket. A lot of thought has gone into this design. The Air Fryer’s looks are more than just skin deep though, and its performance is equally admirable. Putting it through its paces, we were impressed with how simple it was to use, and to clean afterwards. This fryer is so simple to use – with a range of pre-set programs it can fry, bake, grill, or roast. It also does a mean sautéd zucchini, which the majority of fryers miss out on. The instruction manual had plenty of easy to follow diagrams making it practically impossible to go wrong. 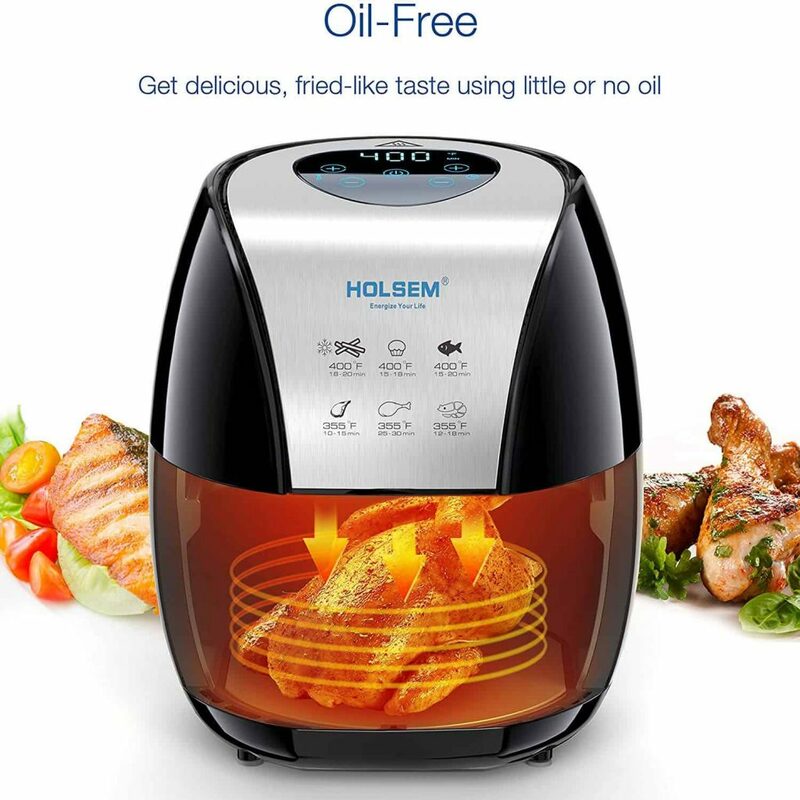 You really can plug in and cook with this fryer! We like the fact that the manufacturers have considered the environmental impact when designing this fryer – the only one we tested that appeared to do so. 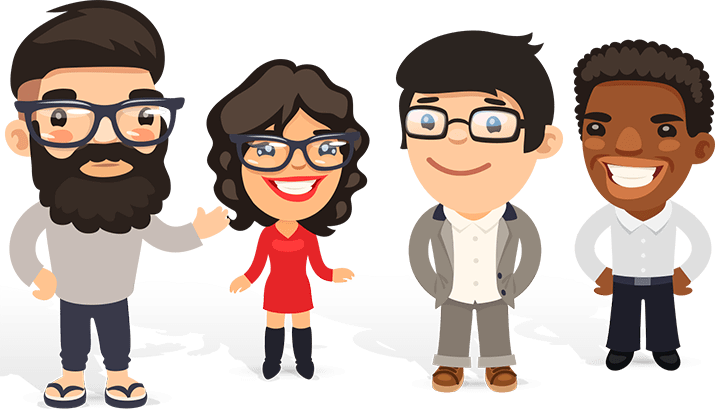 We would recommend buying the larger capacity from the get go. You’ll only end up upgrading when everyone starts dropping round for your delicious fried chicken or doughnuts. It’s not the quietest model tested, but we feel that’s a small price to pay for the speed of the Turbo Cyclone, which the manufacturers describe as a whirlwind of superheated air. It’s black and shiny, curvy and efficient – what’s not to love?